About a year after I got my pilot's license in October of 1988, I went up with one of the flight instructors of our club, to get initiated into "spins". 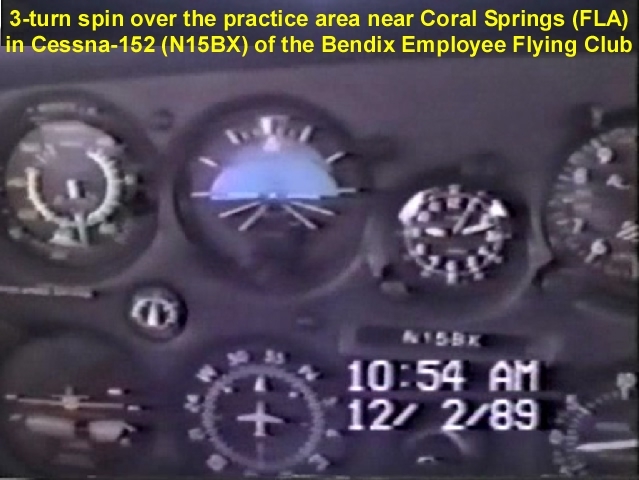 The video clip below shows the view from the cockpit of the light 2-seater airplane (a Cessna-152) during the maneuver. Note that this video shows a fully controlled maneuver (not an inadvertent, accidental spin), performed with a certified flight instructor who has significant spin experience! Don't try this by yourself without proper training from such a flight instructor, nor with an airplane that is not approved for intentional spins! What is a "spin"? A "spin" is defined as "an aggravated stall with auto-rotation about a vertical axis". That just about says it all, right? Well, OK, let's explain what a "stall" is. No, it has nothing to do with the engine stopping - gliders can stall just like motorized airplanes. An airplane stalls if (part of) at least one wing can no longer generate sufficient lift, because the so-called critical Angle of Attack is exceeded. Nothing more, nothing less, nothing else. The Angle of Attack (AoA) is, very simply put, the angle between the line from the wing's trailing edge to the leading edge (a.k.a. 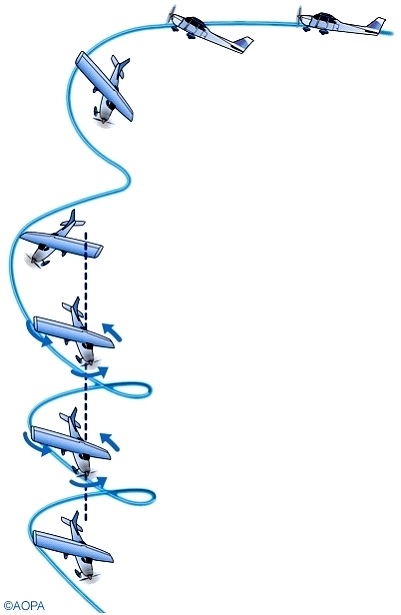 the "chord line"), and the trajectory of the airplane. Note that this is not the same as the pitch angle (the vertical angle between the airplane's longitudinal axis and the horizon). When a wing exceeds the critical AoA, the smooth high-speed airflow across that wing can no longer follow the curved upper surface of that wing - it detaches and becomes turbulent. This results in reduction in the amount of lift that the affected wing produces. At the same time, the drag of that wing is increased. A stall can (be made to) happen at any speed, any power setting, any pitch attitude (e.g., even in a very steep dive), any roll attitude, and any altitude! 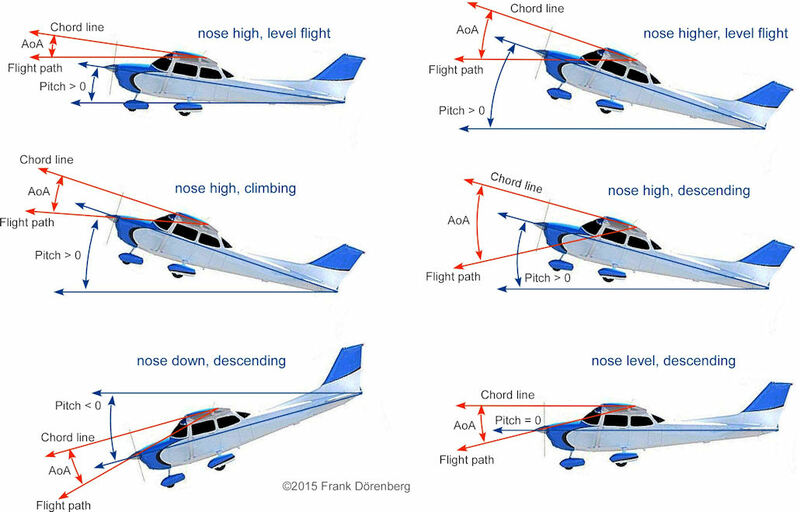 If both wings stall exactly the same way at exactly the same time, and the airplane is in so-called "coordinated" flight (i.e., no side-slip), then nothing too exciting happens (unless the airplane is close to the ground): the nose will drop, departure from straight flight is relatively easily controllable, and the airplane descends until the pilot breaks the stall and recovers. All student pilots learn (and have to demonstrate) how to do this. Things get more exciting during an asymmetrical stall, typically when the pilot is not paying attention to airplane's attitude, airspeed, and side-slip. During an asymmetrical stall, only one wing is stalled, or one wing is more stalled than the other. The wing that is most stalled, loses more lift than the other wing. It will drop: the airplane begins to roll. The dropping of the wing causes its AoA to increase even further ( = deeper stall), and it also produces more drag than the other wing. So the dropping wing is pulled backward, and the airplane yaws - the nose rotates in the direction of the (most) stalled wing. To aggravate things, the wing that moves aft, has a lower airspeed than the other wing, and loses even more lift! The nose drops and auto-rotation sets in. When not immediately corrected by the pilot, the airplane will flip over and rotate towards the ground in a corkscrew pattern: a "spin"! The imbalance of forces and moments perpetuates the rotation. With single-engine propeller airplanes, a left-turning spin may be further aggravated if the engine is not running at idle: the engine exerts torque on the prop (typically turning clockwise when looking at it from the cockpit), and exerts opposite torque on the fuselage, trying to roll the aircraft to the left. A "spin" should not be confused with a "spiral dive"! Such a dive does not involve stalling of wings. Spiral dives are steep, descending turns, with rapidly increasing airspeed and g-forces, increasing bank angle, increasing nose-down attitude, and increasing tightness of the spiral. When not recovered in a timely fashion, the "never to exceed speed" (VNE) may be reached quickly, followed by structural failure and/or impact with the ground. Even before reaching VNE, an incorrect recovery attempt may pull the wings off. However, in a "spin", airspeed is constant, and g-loading is low and also constant. The video below shows the forward view from the cockpit during this controlled maneuver. A standard power-off stall exercise is done at a safe altitude (at least 3000 ft above ground) and after doing clearing turns to make sure there are no other aircraft in the area. 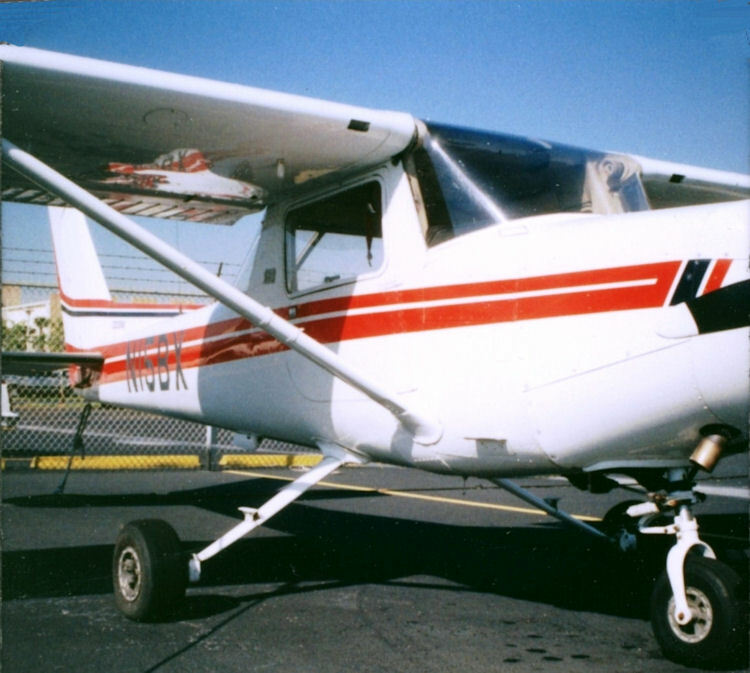 As stated above, this maneuver was done in a Cessna 152. This is a docile, stable, relatively spin-resistant airplane. At the point of impending stall, the stall warning begins to howl. To "encourage" this airplane to enter into a spin, the left rudder pedal is quickly pushed fully forward at the onset of the stall, and is held there. This creates a yaw to the left. You will hear that the engine is briefly revved-up, to generate some torque to help flip the airplane over. You will see the ground spin by, and hear the flight instructor count half and full turns. After 3 turns, standard spin and stall recovery is performed, and the flight instructor is pleased. During a fully developed spin, a C-152 descends at about 7500 ft per minute (≈40 m/s)!